IMGA Height & Weight Calc. This is a simple calculator, to find out your maximum weight to ride your pony. Please be fair and try to get the right values of your pony. The recommended method of measurement is widely used in GB by the Laminitis Trust and is more accurate than a weight tape. First get the pony sanding straight and level, then measure the heart girth (H) using a tape measure that runs tightly around the pony lying at the base of the withers and as close to the front legs as possible. Remember that a pony that is under or over its ideal weight cannot carry as much weight as one that is fit. Referees will be looking out for this. 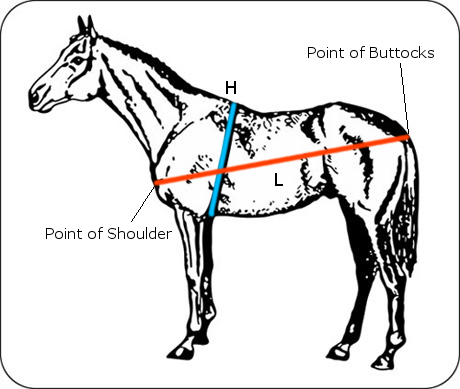 When a pony is at ideal weight its ribs can easily be felt but cannot be seen when it is standing straight, but will possibly be seen when it turns.